Libraries are well known as places for growing great minds. But growing plants? 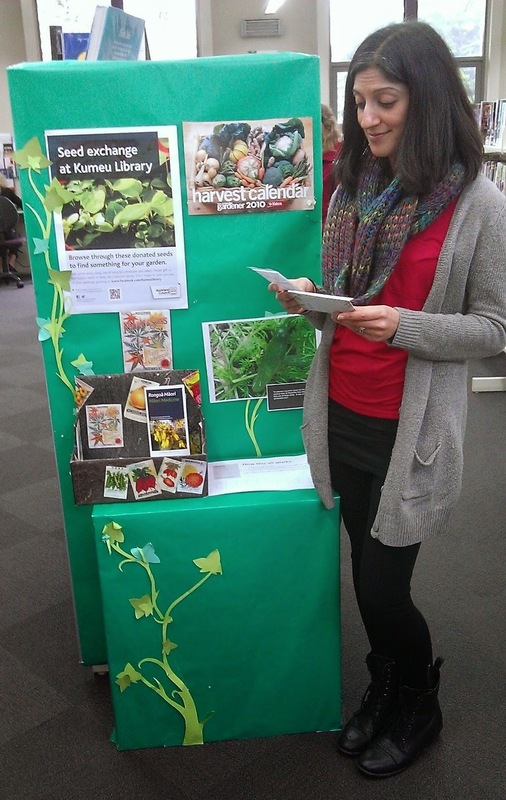 This is what is happening right now through the Kumeu Library seed exchange. enjoyed by customers of all ages. Developed by Community Library Manager Matthew Kerr, the project encourages library users to donate their excess fruit, vegetables, ornamental and native seeds to a central repository at the Kumeu branch, for others to then “borrow” or grow in their own gardens. Matthew said he was inspired to start the seed library after reading an article on the Auckland Council intranet about a similar initiative called The Seed Box. Community Development Project Leader (Central) Ellen Schindler created a box of various seeds to be passed between interested participants who can take out seeds, as well as add their own, before forwarding the box on to the next person. Such was the synergy between the two projects, Ellen donated seeds to form the initial offering for the Kumeu initiative. Since its inception in January 2014 the seed exchange has thrived, with almost 300 people “borrowing” from it, as well as attracting lots of positive comments from customers. “It took off so well in January that for a while there I was a bit worried, as all we had left were sunflower seeds, a few tomato seeds and some weird grey ones that I didn't know much about! However what is interesting is how the collection just fills up. Most of the time, people don't let us know when they donate seeds. You start to get worried, then just turn around and the box is full again!” Matthew said. The seed library also attracts a wide variety of borrowers, from keen green thumbs to complete gardening novices of all ages. “It is fascinating watching the reaction of children as well. They often spot it well before their parents - maybe because they're more curious - and drag Mum or Dad over to have a look and maybe borrow,” said Matthew. As well as being an enjoyable and unique resource for local library users, Matthew believes his library’s blossoming seed exchange also connects with one of the goals in Auckland Libraries’ 10-year plan, Te Kauraoa – Future Directions: to broaden its collections to reflect the diversity of Auckland’s identity. “What I love most about it is that it enables people to share a little bit of our heritage with others in a tangible way - through the natural environment. It's a collection that really belongs in libraries and complements our documentary heritage,” he said. Following on from the success of Kumeu's seed exchange, similar schemes have now been set up at Takapuna Library, Warkworth Library, New Lynn War Memorial Library, Pukekohe Library and Waiuku libraries as well.